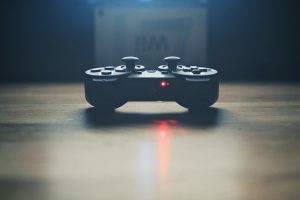 Thinking about a career writing for video games? It’s a hard field to break into, but it is a thing people do. We have a post about it here, with some resources to explore. In considering any career path, a useful step (whether you’re just starting out in college or about to graduate) is to look at some ads for entry-level jobs in that field. Use those close reading and critical thinking skills to learn about the field and its threshold for entry. “Temporary.” That may mean that they have a project underway that requires some extra help, or it might mean that they don’t want to commit to a full-time hire at this level until they’ve had a chance to see someone do the job for a while. Entry-level jobs in creative fields are often provisional this way. Either way, it’s experience that will help you prove yourself to future employers — even if that employer is not DS Volition. Also, rapid turnover is characteristic of video game jobs. If your goal is a stable, permanent job with one company, gaming is not a good career path. They don’t stipulate previous years of experience (that is, after all, what makes an entry-level job entry-level), but they do want “Sample Work.” Many employers in creative fields are less interested in what you’ve studied or what qualifications you have than in examples of how you use your creative skills. They are often particularly interested in things that you’ve created in collaboration with other people. They don’t stipulate a major — it’s on you to demonstrate how your college coursework is “a game relevant discipline.” Note that the ability to be “Proactive in seeking feedback and resolving issues” is baked into success in a Creative Writing workshop-style class. Video game developers who interview a lot of engineers may not know this — but you can tell them. There’s some industry jargon here: “level-design,” “scripting,” “iterate gameplay,” “AAA project.” If you are not conversant with these (and other) terms, then you have a goal for future networking. Find people in the field that you can talk to until you get to a point where you can drop these terms into conversation without feeling self-conscious. The “Qualifications” section mentions a lot of soft skills. Phrases like “self-motivated with a strong work ethic” and “Ability to think creatively and analytically” often sound like white noise, but employers mean something by them and take them seriously. Consider the things that you can point to a resume, or anecdotes from your life that you could bring up in an interview, that would demonstrate that you have these qualities. 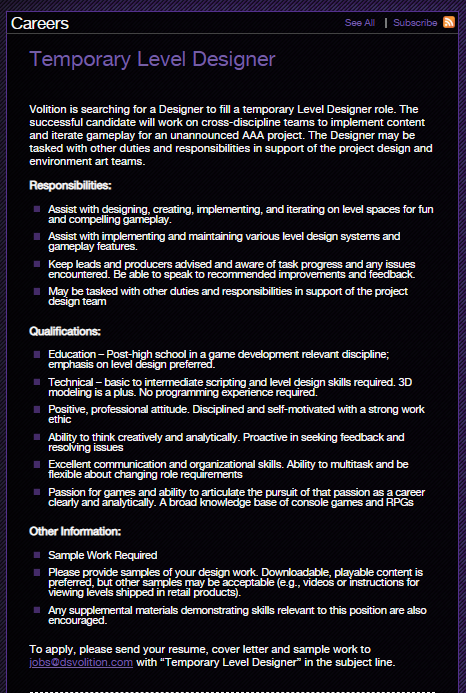 Bottom line: if you’re passionate enough about the inner workings of video games to start creating a portfolio and seeking out industry professionals, then you will be able to make a case for yourself as a candidate for a job like this. If thought of doing those things just makes you feel…tired, then gaming might not be the right industry for you. That’s okay. Look at some entry-level job ads in other fields. Read them with the level of care and attention demonstrated here. Look at lots of ads, in a wide range of fields. Talk to people about what they do and why they like it. There are many paths open to you. This entry was posted in career, job, strategy by KW. Bookmark the permalink.